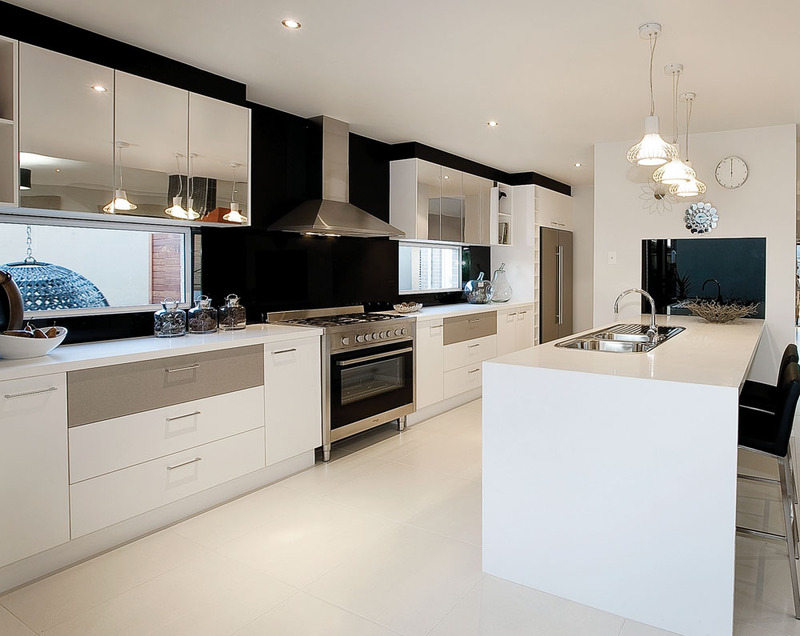 In this article, Catherine McKormack from Home Beautiful looks at how different looks can be achieved in your kitchen by using white cabinetry as a base and changing the splashback, benchtops, flooring and more. 1. Choose your cabinetry. With no door details, it’s all about finish. Glossy polyurethane gives a high-tech feel, while matt has a more relaxed vibe. 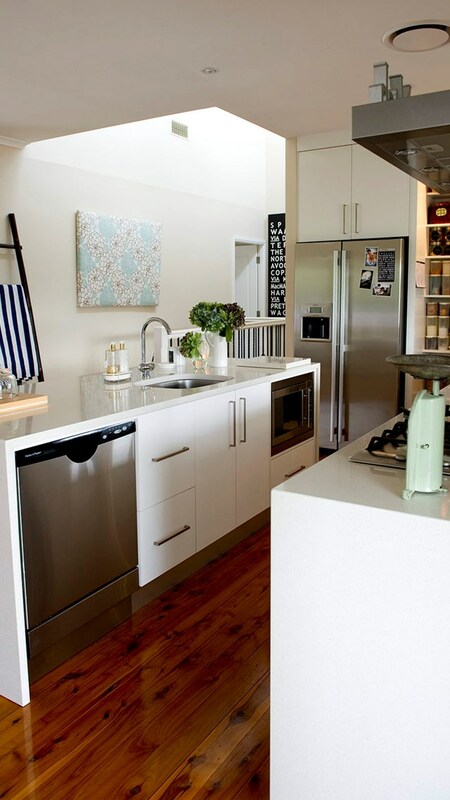 White is the key colour – timeless, easy on the eye and the perfect base for pops of colour or interesting finishes. 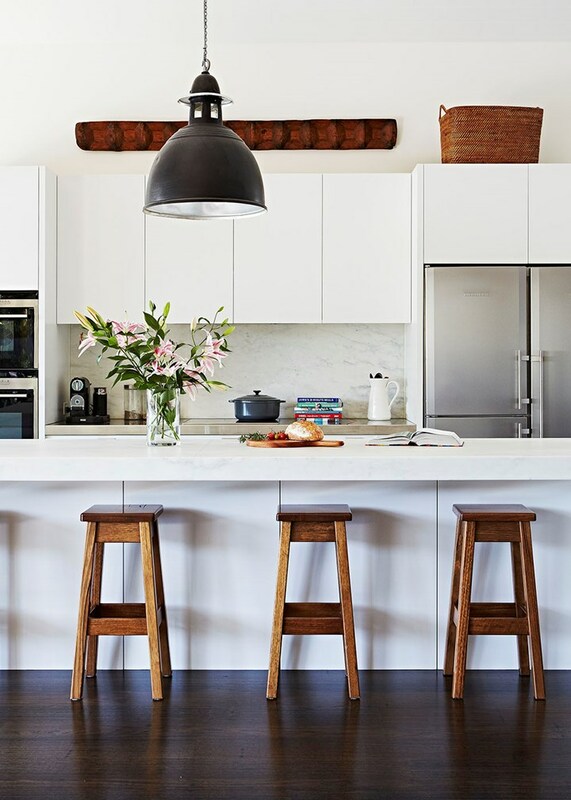 Paired with exposed brick, steel or concrete, the look becomes urban and industrial; teamed with black elements, we’re talking striking monochrome; while mixing in timber, either in larger quantities such as on the floor or in accessories like bar stools, adds warmth. 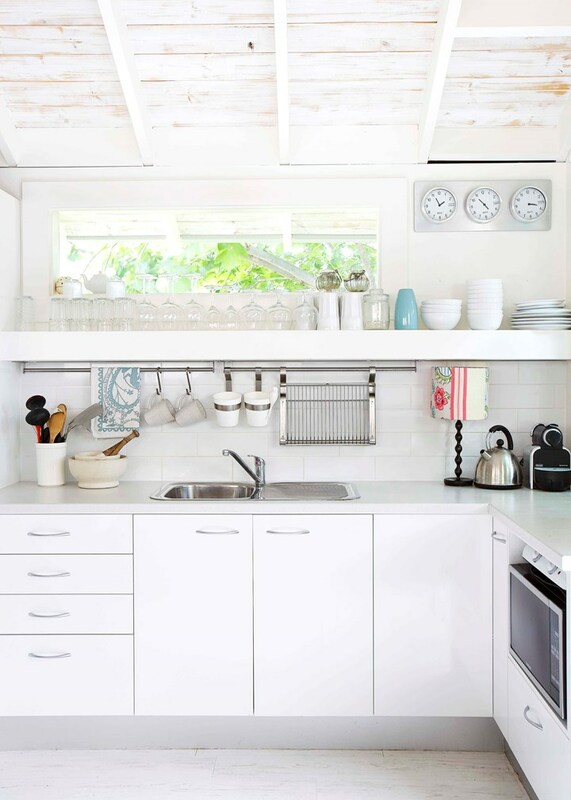 Handles are one of the first things to date, so opt for handle-free, push to open functionality, or go minimal, as in the simple bar handles in the kitchen above. 2. Select a splashback. Almost everything works – marble, decorative or directional tiles, pressed metal or colour-backed glass, which gives you the option to introduce colour, either in a subtle hue, or in a chromatic burst in a primary shade. For a touch of glamour, try mirror. “If you have two mirrored walls facing each other, you can get the ‘infinity effect’, an optical illusion of never-ending reflections,” says Romy Dankner of Homeroom Studio. 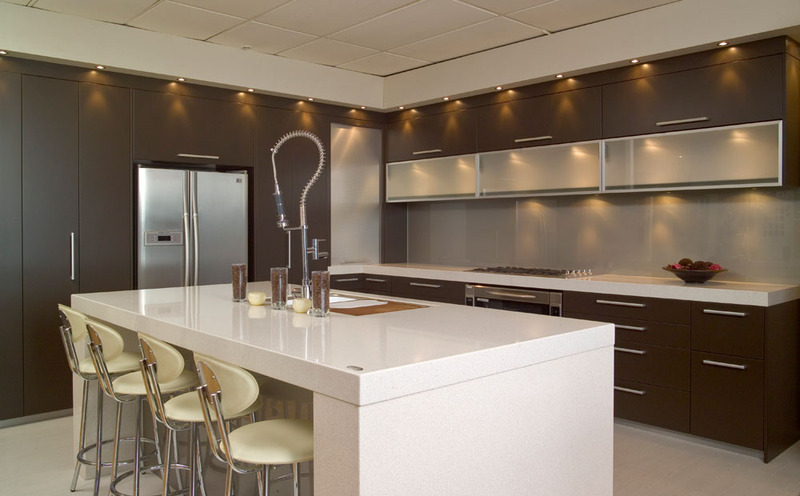 Metals are becoming more popular; stainless steel gives a ‘professional kitchen’ vibe, while burnished metals such as copper introduce a hit of glamour. 3. Pick your benchtop. 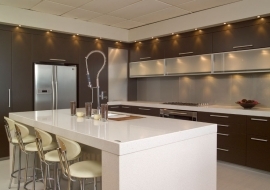 Virtually anything goes in modern kitchens, including timber, cement, stainless steel and reconstituted stone. 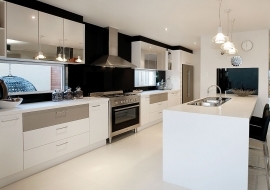 For a join-free finish, try Corian, which can also be formed seamlessly into a sink. 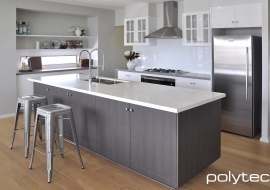 A current trend is to use your benchtop to ‘zone’ areas, such as on an island; for example, have stone or reconstituted stone as the ‘working area’ and introduce a length of timber as a dining spot. 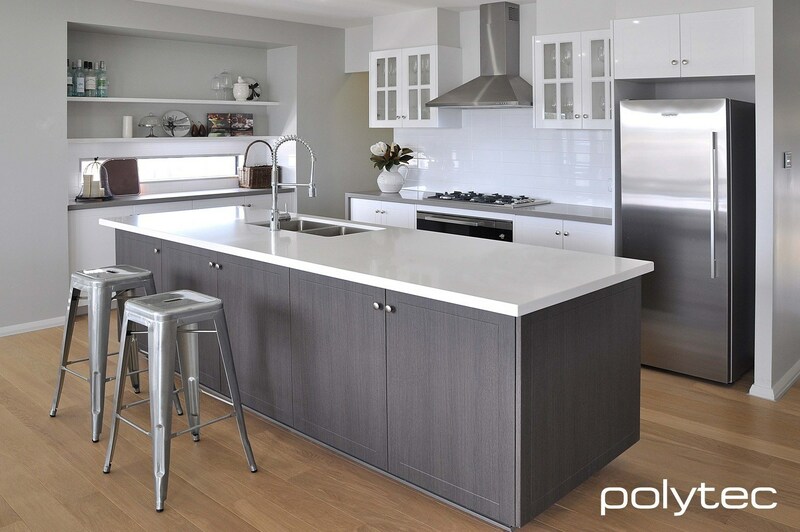 Mixing your materials can also be a budget saver, if you plump for a statement finish such as stone on the front bench or island, and opt for cheaper laminate or stainless steel on the rear bench. 5. Find the right furniture and accessories. A simple backdrop gives you carte blanche to introduce all sorts of items to offset quiet finishes such as plain white, but for a classic look keep it simple. 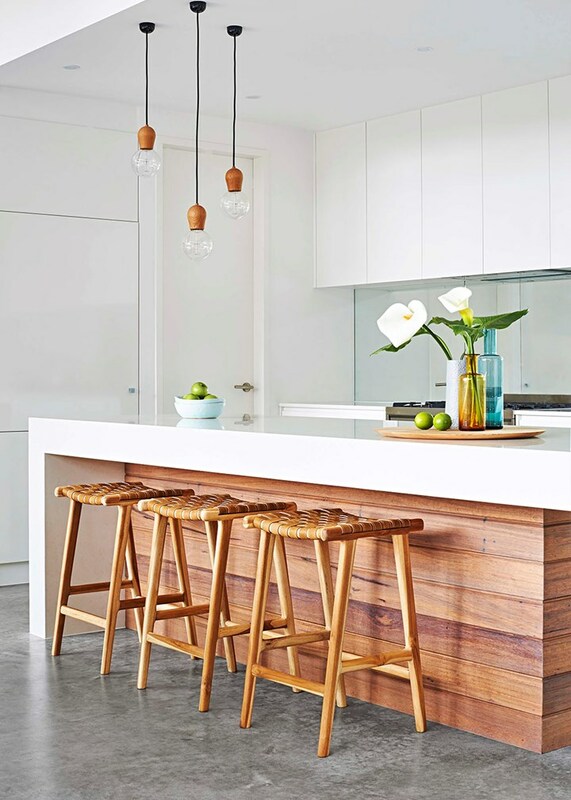 Here, the timber fascia, stools and light fittings give this kitchen truly standout looks – the woven seats add texture and the subtle touches of colour in the glassware are soft and inviting.